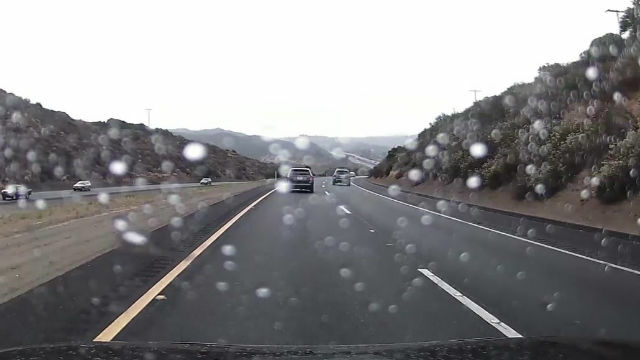 San Diego County was getting light rain Saturday afternoon, but the bulk of the predicted rain and mountain snow is expected to fall overnight into Sunday morning. A low-pressure trough moving over Southern California was predicted to drop a quarter to half-inch of precipitation along the coast and across the inland valleys, up to an inch in the East County highlands, and a tenth to quarter-inch in the deserts, according to the National Weather Service. Gregoria said most of the rain should fall between midnight and 6 a.m. before tapering off. As of 4 p.m. Saturday, small amounts of rain — no more than two- hundredths of an inch — had fallen in Escondido, Rancho Bernardo, Mission Valley and other areas, the weather service said. A little less than a tenth of an inch of rain was recorded at a gauge along Interstate 8 near Boulevard. The unsettled atmospheric system also may put down some layers of frozen white flakes — up to several inches worth — in elevations above 5,000 feet, including lofty locales such as Cuyamaca Peak and Palomar Mountain. Gregoria said there was some reported snowfall on Palomar Mountain on Saturday afternoon, but it had since turned back into rain. The storm also was causing a large swell contributing to high surf at local beaches. Those conditions are expected to last through Monday morning, when the surf should drop quickly. Dry weather is expected through Wednesday, when a fast-moving follow-up storm is likely to generate some modest showers into Thursday morning.